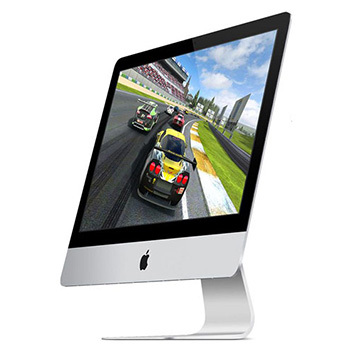 The iMac "Core i3" 3.3GHz 21.5-Inch Early 2013 (Educational Model) is powered by a Dual Core 3.3GHz Intel "Core i3" I3-3225 Ivy Bridge processor with a 256k level 2 cache per core and a 3MB level 3 cache along with (shared memory) integrated Intel HD Graphics 4000 graphics processor. Base configuration comes with 4GB DDR3-1600 (PC3-12800) SDRAM (difficult to access to upgrade) and a 5400 RPM 500GB hard drive, a "FaceTime HD" webcam and stereo speakers with no optical drive. This model has a 21.5" 1920x1080 LED 16:9 widescreen IPS display with the cover glass fully laminated to the LCD with a matte finish".